Norwegian champions Rosenborg are due to sign Ivory Coast attacking midfielder Didier Ya Konan on a three-year deal. French side Nantes were also thought to be interested in the midfielder, but Ya Konan has opted for a move to Norway. The 23-year-old moves from leading Ivory Coast side Asec Mimosas for an undisclosed fee. 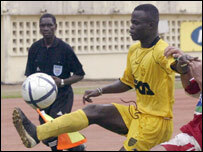 Ya Konan had scored 16 goals in the Ivorian league and eight in the African Champions League. Rosenborg scout Stig Torbjornsen said: "There are no doubts about his individual qualities. "I have been to Ivory Coast 40 times and have got many good contacts there who have all confirmed this. "Also he has already made his debut for the Ivorian national team." Ya Konan trained with English Premier League side Charlton Athletic in November.